Ms. Karin Ridgers, founder of the internet TV station--Veggie Vision, (www.veggievision.tv)) is also editor of the vegetarian magazine Off the Hoof. She has worked tirelessly over the last decade to promote the vegan diet and to bring awareness to people of the benefits of this lifestyle. Her voluntary work helped the Hopefield Animal Sanctuary to be saved, when readers of national newspapers sent in over £20,000, thus protecting the lives of more than 200 animals. She also works with ethical companies, helping raise their visibility in the media. Karin’s career has included acting, with film and TV roles as well as hosting various documentaries. Moreover, she has been a spokesperson for the Vegan Society and Viva! During 2008 Karin was asked to take part in over 40 radio interviews, including being a participant on Sadie Nines’ BBC Essex Show. For her dedication to the noble cause of animal welfare, Ms. Karin Ridger was honored with the Shining World Heroine Award by Supreme Master Ching Hai. 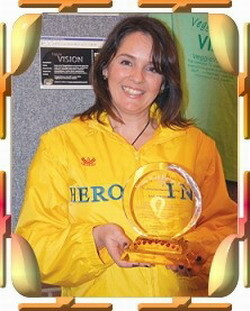 On November 30, Golden Year 5 (2008), our UK Association members presented her with the Award at “Cruelty Free Christmas,” an Animal Aid event, where Karin had a stand promoting her internet TV station. 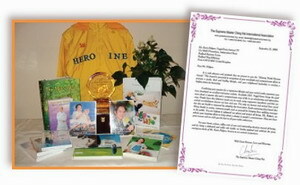 When Karin stepped away for a few moments, they took the opportunity to arrange a table with the beautiful plaque, many lovely gifts and the Heroine Jacket especially made for her. When she saw the table upon her return, her eyes filled with tears, and she said she could not believe the love emanating from that table. As the Award presentation proceeded, a small crowd gathered, applauding as she accepted the beautiful crystal plaque and listening lovingly as the letter from Master was read aloud by one of our Association members. I can not thank you enough for my wonderful Shining World Heroine Award. To say that this made my year is an understatement!! I had no idea of the impact of reading one of your books about 14 years ago – my life has changed, and my passion and my life is dedicated to promoting a healthy compassionate way of living and eating – the vegan way, of course! And all these years later I am in touch with your wonderful people in England and was lucky enough to receive this award. I am amazed at the universe!! Thank you so much for sending the wonderful gifts to me too – your signed letter is proudly being displayed in my lounge and the other day the sun shone in through the window and onto the award - I have never seen such a beautiful rainbow coming through and shining in my home!! Thank you again and I wish you and your team the very best vegetarian wishes from England.